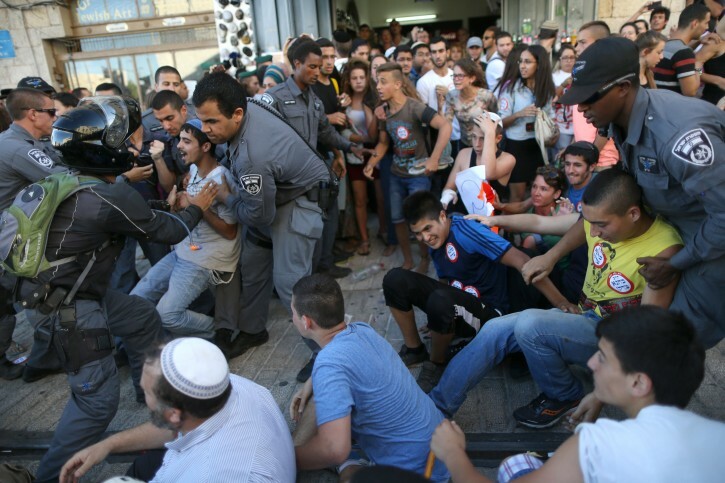 Jerusalem - An initially peaceful protest over the murders of Gil-Ad Shaer, Eyal Yifrah, and Naftali Fraenkel at the entrance to the capital Tuesday afternoon turned into a protracted riot, spanning much of the downtown area, including the Old City’s Jaffa Gate. According to one eye witness, the violence began in front of the Central Bus Station at approximately 4 p.m., shortly after demonstrators blocked traffic on two major roads near the busy station. “The cops came because they obstructed traffic,” said Lia Kaman, a Jerusalem Post intern, who unwittingly became embroiled in the melee. “The police kept trying to get them off the road, and that’s when they started arresting people. Kaman, a Hawaii native studying and working in Jerusalem, said she was struck in the face by an officer as the police attempted to contain the unruly crowd, although she was not seriously harmed. Kaman said a group of the protesters then gathered rocks to defend themselves, although none were thrown. “There were three fights going on at once between the police and protesters,” she said. After the violence abated, Kaman said a group of the protesters marched up Jaffa Road, where they soon converged upon an Arab-owned store and shouted at its owner, while his two small children watched on. After leaving the store, the growing mob continued up Jaffa Road to the shuk, where they blocked the Light Rail’s train tracks and damaged a moped, she said. “The cops then blocked off all the entrances to the shuk to prevent them from getting in and they soon left without any violence,” Kaman continued. As the protest attracted more and more young people, Kaman said hundreds assembled approximately 30 minutes later at Jaffa Gate in the Old City demanding revenge. Moments later, as a police helicopter hovered above and officers on horseback attempted to quell the protest, the group went converged on City Hall’s Safra Square while chanting “Kahane was right” and Revenge!” and wearing stickers stating the same words. Asked why she was joining the protest, teenager Noa Ben-Hamo, who was accompanied by two friends, expressed exacerbation over the murders of the three teenage yeshiva students. “We are very angry and we came here to protest the terrorists,” said Ben-Hamo, as hundreds of other protesters continued down Jaffa Road followed by dozens of officers. “We don’t want to live in fear and we don’t want war with the Arabs, but we want the terrorists to stop doing this because we are Jewish,” she continued. I was there waiting to get through the lights. I didn't see any violence, just chanting & giving out bumper stickers. Yes they blocked traffic, but so what? They were 1000% right, just like the aticker that says Harav Kahane was right. I put the stickers oin my car. You have a problem? Too bad. In Israel, they actually mean it when they talk about freedom of speech.